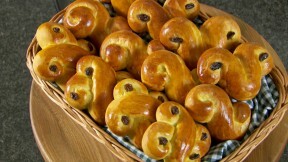 This St. Lucia buns recipe by Paul Hollywood is featured in the Season 1 Masterclass: Christmas episode. Pour the milk into a small pan and warm over a low heat until gently steaming. Remove from the heat, add the saffron threads and butter and leave to stand for 10 minutes or until lukewarm. Tip the flour into a mixing bowl, add the salt to one side of the bowl and the yeast to the other and add the sugar. Add the saffron milk mixture and Quark cheese and turn the mixture round with your fingers. Continue to mix until you’ve picked up all the flour from the sides of the bowl. Use the mixture to clean the inside of the bowl and keep going until you have a soft dough. Tip the dough onto a lightly floured surface and begin to knead. Keep kneading for about 6 minutes. Work through the initial wet stage until the dough starts to form a soft, smooth skin. When the dough feels smooth and silky, put it into a lightly oiled bowl. Cover with clingfilm and leave in a warm place for 1½-2 hours until doubled in size. Grease 2 baking sheets with oil. Knock back the dough and divide into 12 equal pieces. Roll 4 of the pieces into a long strand about 30cm long. Twist each into an S-shape, as tight as possible. Place on the prepared baking sheets. Shape another 4 pieces of the dough into a Christmas cross & the remaining 4 pieces into Ox shapes and cover loosely with a plastic bag. Leave for 30-45 minutes until doubled in size. Preheat the oven to 400F. Brush the rolls with the egg yolk, then place one raisin in the center of each spiral (two raisins per roll). Bake the rolls for 15 minutes, then remove from the oven and set aside to cool on a wire rack.